Four third-graders from Prairie Lane Elementary School (from left) -- Alex LeClair, Preston Kratky, Tyler Hanna and Jude Van Belle -- raised $100 for the Fred & Pamela Buffett Cancer Center by teaching some of their classmates how to play sports by conducting a two-hour camp for the low cost of $5. The boys were recognized by Beth Welke, school principal, at left, and Tom Thompson, who received the check on behalf of the University of Nebraska Foundation. Philanthropy comes in many different forms. But this was special. It happened at Prairie Lane Elementary School in the Westside Community Schools. Four third-grade boys from Prairie Lane came up with a unique idea for raising funds. The boys -- along with their dads -- would teach younger children in the school how to play sports. Specifically, basketball, soccer and flag football. They held their sports camp after school and charged $5 for each student who participated in the two-hour session. It was an easy sell. As Terry Hanna, one of the fathers, put it jokingly, "It was cheap day care." Plus, there were incentives -- free popsicles and water -- for all participants. The money rolled in. A total of $250 was raised. The boys took $150 of the proceeds and used it to purchase sports equipment for the school. The remaining $100 went to -- get this -- the Fred & Pamela Buffett Cancer Center. Hanna, development director for the Westside Community Schools Foundation and a former fundraiser for the University of Nebraska Foundation, said the idea to give to the cancer center came from the boys. They said, "We want to raise money for cancer. We really want to do this." "We feel bad for other people that have cancer," said Tyler Hanna, Hanna's son and one of the four boys involved in the fundraiser. "We want to help them out." On May 25, the entire student body and faculty of Prairie Lane gathered for the check presentation in the school gymnasium. Tom Thompson, senior director of development for the University of Nebraska Foundation and the foundation's chief liaison to the Fred & Pamela Buffett Cancer Center, received a "blow up" version of the check. Thompson, who went to elementary and high school in the Westside Community Schools, was inspired by the thoughtfulness of the young boys. "I told the boys that some of our most generous donors to the university started more than 50 years ago giving just $25 a year," he said. "In light of their giving spirit and hard work, I wouldn't be surprised if someday they'll be making donations that can impact the future." Thompson added, "While it's great that these boys are helping in the fight against cancer, it also illustrates how this disease is impacting the lives of far too many of our friends and families." My congratulations and thanks to these young men and the fathers who supported them in this endeavor! This is awesome! Nice work, kids! 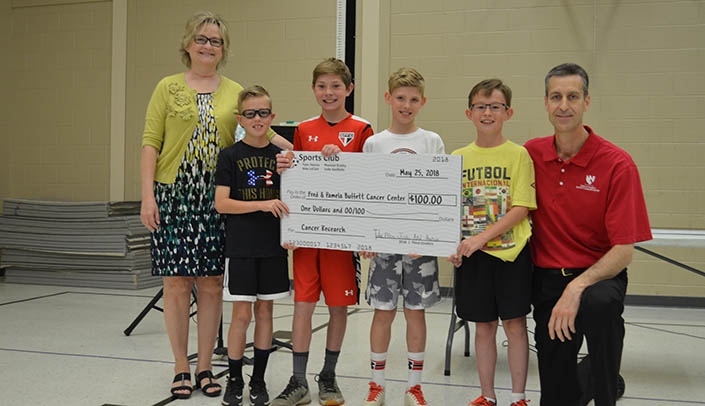 This marks the second consecutive year that the four boys at Prairie Lane Elementary School raised money through a sports camp fundraiser. Plans are already in the works for a similar event next year, said Terry Hanna, father of one of the boys. To bring in more money, the boys plan to increase the cost of the camp from $5 to $10. If anybody is unable to pay the additional charge, the boys will create a scholarship fund to make up the difference. Hanna wasn't surprised by the boys' generous donation to the Fred & Pamela Buffett Cancer Center. "Omaha is known around the world for being a very philanthropic community," he said. "Omaha is all about giving back. The boys are learning that success can result when you take advantage of trying to help people. It's a great lesson that will set them up to be future community leaders." The students and their fathers who worked the sports camp were: Tyler Hanna (father - Terry); Pearson Kratky (father - Bryan); Alex LeClair (father - Jason); and Jude Van Belle (father - Russ).